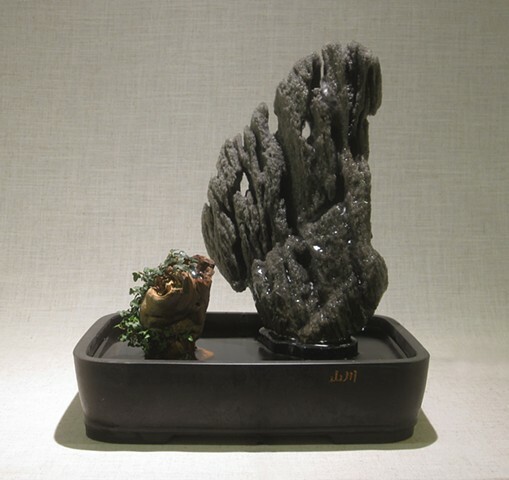 Referred to in the west as “scholar’s rocks”, gongshi have been collected by Chinese connoisseurs since the Tang dynasty (618-907). Appreciation of these ancient stones in the west began to develop during the last decades of the 20th century*. Feather rock is far too soft to endure for the centuries typical of gongshi. But the volcanic origins of this stone often impart dramatic internal patterns worthy of appreciation, as revealed in this composition. **Gerstle, M. (2006). Beyond Suiseki. Arcata: Water Stone Press. pp. 15-23. 12" x 9" x 15"